This is our new 95% polyester 5% rayon (rayon aids in absorption) SUPER SOAKER adult bib. 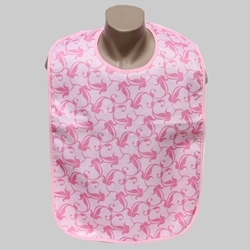 This bib is designed to absorb liquids better than other bibs on the market. It is 17.5" wide x 28" long and features a hook & loop neck closure (similar to VELCRO BRAND closure). 100% polyester scrim on the back adhered to a vinyl back barrier.